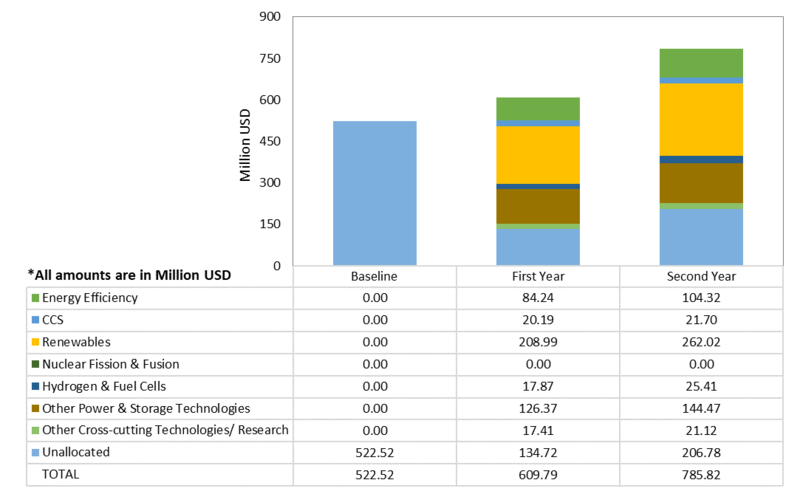 Note: The Mission Innovation baseline for Germany (450 million Euros) was defined by averaging the budget for project funding within the 6th Federal Energy Research Programme on renewable energy and energy efficiency technologies for fiscal years 2012 to 2015. Funding for Nuclear Safety Research is not included, since nuclear energy is not included in the definition of Clean Energy used by Germany in the context of Mission Innovation. In addition to project funding within the 6thFederal Energy Research Programme the numbers reported below for 2016 and 2017 also include new programmes for Clean Energy demonstration projects that started after the launch of Mission Innovation. International cooperation on artificial photosynthesis and solar fuels is a focus of the recently published 7th Energy Research Programme of the German Federal Government.